Her spot is probably at 38.08 22.61 in Suramar. There's a bagback and a fishing rod on a crate. Not seen the npc yet. But maybe a good start. Getting maximum reputation with all the Fisherfriends will award Fisherfriend of the Isles and unlock a color variant of the fishing artifact weapon. Below is a list of all items they sell, and below that is a list of all Fisherfriends. All fishing locations are close to the Fisherfriend. You will have the Something's Fishy buff when at the right spot. Based on my experience so far, each Fisherfriend is basically like Margoss, only they take about 2-3 hours in a raid to reach Best Friend and purchase all unique items from. Each turnin item gives 75 rep instead of 50, there are bosses to summon just like the elemental that will make every catch give you the turnin, while the buff is active you fish up 3-4 of the turnin instead of only 1-2, and each fisherfriend has fewer and cheaper items. You need to be close enough to the fisherfriend to have the Something's Fishy buff to catch the turnin or boss summoner. The boss's health goes up the more people hit it, but it does still seem to be more efficient to have as many people fighting as possible. There are six fisherfriends, and they rotate daily. So far there doesn't seem to be a way to tell which one is up besides looking for yourself or checking custom groups. Each fisherfriend is associated with one fishing area (the five zones and the ocean) and sells the fish for their area (10 for 10), each special bait for their area (25 each), a fishing bobber toy (100, Best Friend), and one other item (generally 50, Good Friend). Reaching Best Friend with all six grants Fisherfriend of the Isles, which gives Underlight Emerald, unlocking new tints for Underlight Angler. Keeper Raynae in Val'sharah (53.41, 72.86) at Lorlathil sells Recipe: Feast of the Fishes and Crate of Bobbers: Face of the Forest. Akule Riverhorn in Highmountain (32.62, 40.80) by Thunder Totem sells Trawler Totem and Crate of Bobbers: Floating Totem. Corbyn in Stormheim (90.69, 10.87) at Shield's Rest sells Corbyn's Beacon and Crate of Bobbers: Carved Wooden Helm. Sha'leth in Suramar (50.71, 49.34) sells Leyscale Koi (cost = 5 each) and Crate of Bobbers: Replica Gondola. The description on this page says that she is a withered when she is in fact a night elf. Sha'leth is at 50.7, 49.3 in Suramar, which is located on The Grand Promenade, southeast of Tel'Anor. On the map, it's where the right finger of water meets the edge of the circle marking the start of the city. She's standing next to the foliage on the edge of the bridge, halfway across, with a beautiful tiered waterfall behind her. Upon approaching her, you will gain the Something's Fishy buff. This does not mean that you can only fish next to her, however. If you look in the water behind her, there is a traveling School of Golden Minnows (big yellow/green circle) and THAT is where you need to fish. Waterwalking vitally helpful. When you fish up the Glowing Fish Scale, you need to be near Sha'leth to use the item and summon Magicus. When he dies, make sure to loot him! He drops somewhere between 20-30ish Golden Minnows. If he was killed on the water, his body will sink to the bottom and the loot won't be very evident. Don't forget to swim down and pick it up. This fisherfriend actually works very differently from the usual routine. The aquarium pond has a very large School of Golden Minnows. It's green and yellow in color, and slowly drifts around the perimeter of the aquarium pond area. Even if you aren't in range of the actual Something's Fishy buff, fishing from the school guarantees getting one Golden Minnow on every cast, except for the occasional Glowing Fish Scale that summons Magicus. This summon mob works differently, as well. Whereas other fisherfriends' mobs drop nothing and imbue the water to grant 100% catch rates of multiple rep items, Magicus simply drops the Golden Minnow himself, without affecting the pond. The amount he drops varies greatly; the range I've seen is 20-50 from a kill. Between the school and Magicus' drops, reputation goes by very rapidly. Use water-walking of some kind. The pool is literally in motion, and parts of its path runs along cliffs and walls. To effectively follow it, use: class-based water-walking abilities, an Underlight Angler with the Surface Tension trait activated, the Anglers Fishing Raft toy, or invest in some Draenic Water Walking Elixir or Elixir of Water Walking. Enlarge your fishing bobber. I was having some difficulties from time to time being able to interact with my bobber. Whether the lily pads, particles in the air, or the pool itself obstructed it, using a larger than default bobber helped reduce lost casts. Using the Oversized Bobber items make it the largest, but I personally made do with the tall Crate of Bobbers: Can of Worms bobber. Aim your cast at or before the leading edge of the moving School. The school is wide enough that most casts should successfully complete before it's moved out from under the bobber if you aim this way. Even if it has moved slightly off before the bobber splashes, you still usually succeed with a minnow. Fight Magicus in the water. He is one of the easier NPCs to fight, but taking it into the water is even easier since his ground effects end up on the bottom of the pond and don't damage you from there. His corpse will fall to the bottom when defeated, but you don't have to rush to loot since he doesn't imbue the pond in the way other summons do. Half our raid was standing on a pillar on the other side of the pool doing nothing and when i asked why, i got removed from the raid. I smell an exploit. Edit: I found the exploit. They spawn Sleeping Murlocs that drop rare fish on the pillar (so they can't run away and all the fish drop in a single place) to gain insane artifact points for their fishing pole. They just stack ontop of eachother, hotkey the Pufferspine Fish and just spam the button/macro/bot the fishing pole rep. Stood there for 5 seconds and got 8 rare fish for doing nothing. Sha'leth is a bit odd. Her reputation info says she's "A mysterious withered who makes her home by the waterfalls." She isn't a withered. She has a night elf model. I wonder if she's a placeholder that got forgotten about. Her speech is also a little disjointed. All the other NPCs describe a problem they're dealing with a a task they want you to help with. She only says that the fish are her friends and you're given a dialog option asking her how you can help. Oh! First and foremost the koi in starting to overcrowd. Maybe if you caught some of the minnows I could release them into the rivers? Sounds like this should read: "the koi in are starting to overcrowd ..."
Regarding the strangeness with bobber interaction while fishing: I found that if I angle my camera view way down so it's just hovering over the water I didn't have problems interacting with my bobber. This CAN make it difficult to judge the placement of the pool however. Trying to complete this is annoying. Formed a group only to have most of the group stand over on the pillar doing the pufferfish exploit, just coming in to loot the mini boss after everyone else had done the work. Screw that. I'm not going to bother with this fisherfriend part of the achievement until the exploit is fixed. So i was fishing from the pool just fine when it and Shaleth disappeared. Anyone else have this problem? She is still listed as the Fisher friend of the day. I only fished up 5 golden minnows before the pool de spawned and she was no longer standing on the bridge. Hated this one, path of frost is iffy at best of times and people running over your lure is a pain. Just bad design by Blizz. If you are having issues with your hook not showing up, try having the camera angle close to the surface of the water. That angle really helped me out. No missing hooks after I found that out. Oh, and you do not actually have to loot your fish while the bobber is in the pool. It seems as if it is enough that your bobber has been in the pool at some point. I *strongly* advice doing this in a group. I used the group finder and joined a raid, we were constantly around 35 people, and were able to resummon Magicus within seconds after each kill. In less than one hour, I got full rep, the toy and a few thousand AP for the fishing rod. I did not use the trick to spawn the murlock in a locked position, so that it drops every fish in a single spot, since I'm unsure if Blizzard would regard it as an exploit. A few others in the raid did, though. On a side not, not sure if something has changed, but I see comments here about Magicus dropping up to 50 Golden Minnow. Not once did I see any such number, neither for me nor anyone else in the raid group. We constantly got 20, 25 or 30 for each kill. Is there some prerequisite that needs completed before she will appear? The short explanation, starting from no rep, is turn in the fish from the mob/pool until a "Good Friend". Then at that rep you can buy the murloc for 25 fish, then drop it for lots of artifact power for your fishing artifact. I found this a very fast way to level my Underlight Angler as well. She sells Sleeping Murloc for 25 Golden Minnow. Each one of them gave me 8-17 Seerspine Puffer. I joined a raid group for it and could buy a murloc about every 5-10 minutes. By far the easiest fisherfriend to get to Best Friend. Took me about 50 minutes to get Best Friend and buy a toy in raid group with 20+ people. Others took me around 2 hours. Just remember to tag the spawned mob and loot it. Fishing actually provides very little to a total amount of fish you will need to turn in, its mostly a source of spawn item for the elemental. For Fisherfriend of the Isles you need to obtain "Best Friend" level of Reputation with six fisherfriends. If you're human, which gives Racial - Human, OR have any other 10% buff, such as WHEE! from the Darkmoon Fayre you get 82.5 rep each, so need only 510 No. If you're human, which gives Racial - Human, AND have any other 10% buff, such as WHEE! from the Darkmoon Fayre you get 90 rep each so need only 467 No. You know you're in the right area because you'll get the buff Something's Fishy. Hand in Shiny Bauble to the NPC Corbyn in Stormheim for 75 / 82.5 / 90 rep with the faction Corbyn. Hand in Golden Minnow to the NPC Sha'leth in Suramar for 75 / 82.5 / 90 rep with the faction Sha'leth. Hand in Desecrated Seaweed to the NPC Impus in Broken Shore for 75 / 82.5 / 90 rep with the faction Impus. Hand in Fragmented Enchantment to the NPC Ilyssia of the Waters in Azsuna for 75 / 82.5 / 90 rep with the faction Ilyssia of the Waters. Hand in Corrupted Globule to the NPC Keeper Raynae in Val'sharah for 75 / 82.5 / 90 rep with the faction Keeper Raynae. Hand in Ancient Totem Fragment to the NPC Akule Riverhorn in Highmountain for 75 / 82.5 / 90 rep with the faction Akule Riverhorn. With Racial - Human, AND have any other 10% buff, e.g. WHEE! you get 90 rep each so need only 467 No. With both Racial - Human and WHEE! and in a large raid group, I reach Best Friend in just under one hour. When saving up totem fragments to purchase the bobber be careful you don't end up giving her all your fragments because you've been doing that for the past few hours. Blizzard didn't have the common sense to prevent you from wasting fragments for rep when already at max level. Drag the macro icons to an action bar. The icons for the tool tips will be the default red question mark until you make your first catch. Then the icon will change to the inventory icon with the count. When you turn in Golden Minnows or summon Magicus using the Glowing Fish Scale, the count will go to zero but the icon will remain. If you're solo fishing when Something's Fishy is up, it's really useful to know whether you've caught a Glowing Fish Scale because you can only have one in your inventory at a time. As soon as you catch a Golden Minnow, the icon (with count) will replace the default icon. If you turn in Golden Minnows, the icon will remain and the count will go to zero. Exchange Drowned Mana for Arcane Lures. 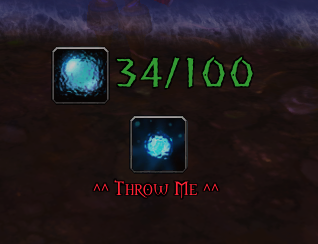 Keep Arcane Lure up to increase your chance of catching bait that attracts rare Suramar fish. The best advice I found regarding interacting with your bobber is on this page but it is hidden in some replies. If you don't stand in the moving Golden Minnow pool, you can always interact with your bobber. Simplest solution and it works! Zero explanation from the NPC as to how it works. Birds and other neutral NPCs flying into your camera when you're watching the bobber. Other people walking in front of your bobber because the pool keeps moving. Right-clicking the bobber only to find you can't click it because the pool obstructs it, and then moving your camera to try and make the bobber clickable just drops you into the water, and you don't get your catch. Constantly dropping into the water because your camera is tilted downward ever too slightly more than the game thinks it should be. Struggling to tag the miniboss before the whole raid just nukes it. Missing out on a tag because you were at a corner fishing up minnow and didn't react to the spawn in time. The miniboss' corpse being on the bottom of the pool instead of where it died. - this was my most hated of the fisherfriends I've done so far. The only redeeming feature is that it's over relatively quickly compared to the others. These are the correct values without modifiers. If you play a Human, you get a 10% modifier. And there's the possible 10% Whee! buff. prints a list with the Golden Minnows counted in your inventory (maximum 100), and estimation of the artifact power that can be gained. A mysterious withered who makes her home by the waterfalls.